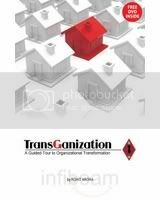 “The process of changing the organizational genetics at the time of changing market scenario or changing business model or during the phase-shift from one state to another is called TransGanization”. This is how the author defines the word transganization. The book, recently published by times books, makes it for an easy read. It is a relatively small book and finish-in-one-go kind of book. The additional disc given along with the book is a welcome add-on to listen to the authors views on the same. it probably could have been better if it could be more engaging than the monologue approach that it takes. The book succintly captures the operational issues cropping in during the trajectory of the growth of an organization. It very well explains the strategic approach to ensure the vitals are kept in place while the transition from a free spirited entrepreneurial start-up kind of a setup to a professionally run company. The interesting part of the book is where the author begins by explaining scenes from the movie Avatar, and links it to the main topic. The only disconnect with the book is – who is the target audience? Obviously not the big companies looking for a change! The entrepreneur who is ready to take off, and wants to build a perspective on organizatoinal change? Then why have all the copy-paste material from government sites as the the entire procedure and detail rules and processes involved? Overall, a good book to get a perspective on the concept, but it falls somewhere in between being an academic book and an engaging read. About the author, he is an engineer from IIT, and has done his management studies at ISB, Hyderabad. With more than 11 years of experience in the field of organizational change leadership he is probably the most apt person to write a book on this niche topic. Funny: Why was an ad of Jawed Habib’s pasted in the backside inside cover of the book? How is he involved with the book? Or have we reached the stage where even the covers are book are up for sale by the advertisers?